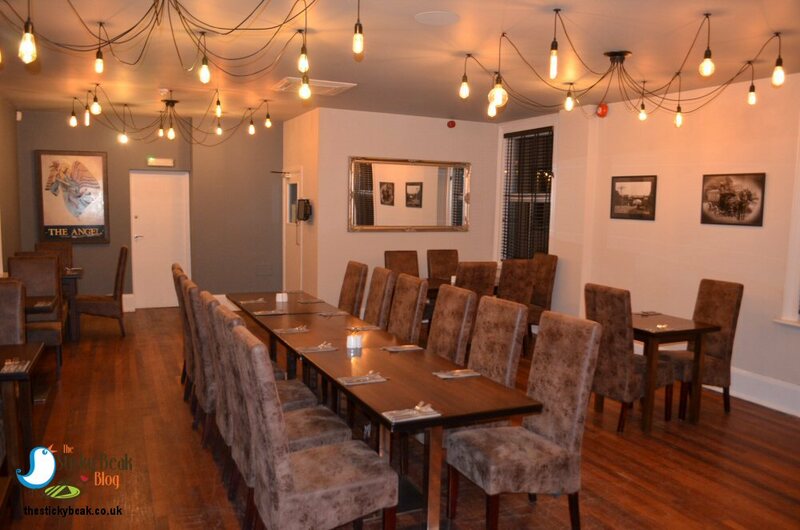 After about 5.5 years in the food review game not much phases or shocks me anymore, but His Nibs and I came away from Angel and Harlequin Bistro in Spinkhill feeling completely gob-smacked! In a nutshell, the standard of the food and the service went way beyond what you would expect from what was essentially a village pub. Read on, and I’ll enlighten you a little more. 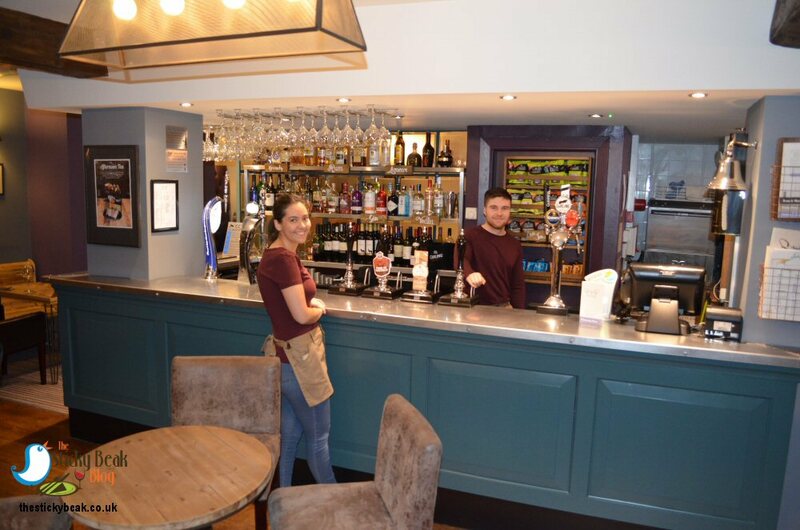 Angel’s owners, Chef Chris Norfolk and his wife Jean, aren’t strangers to the food and drink trade; they also own The Elm Tree at Elmton, a country pub which enjoys a good reputation (and does good grub too, apparently). The Elm Tree’s recipe for Beef Wellington features in the Derbyshire Cookbook: Second Helpings, if you’re interested. As with a lot of village pubs, the Angel came under threat a few years ago and the locals launched a “Save The Angel” campaign. 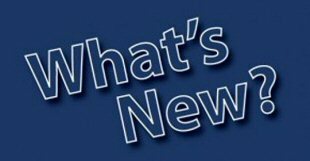 The local council stepped in and designated it as an asset of community value to prevent it being turned into residential accommodation, and Chris and Jean bought it. 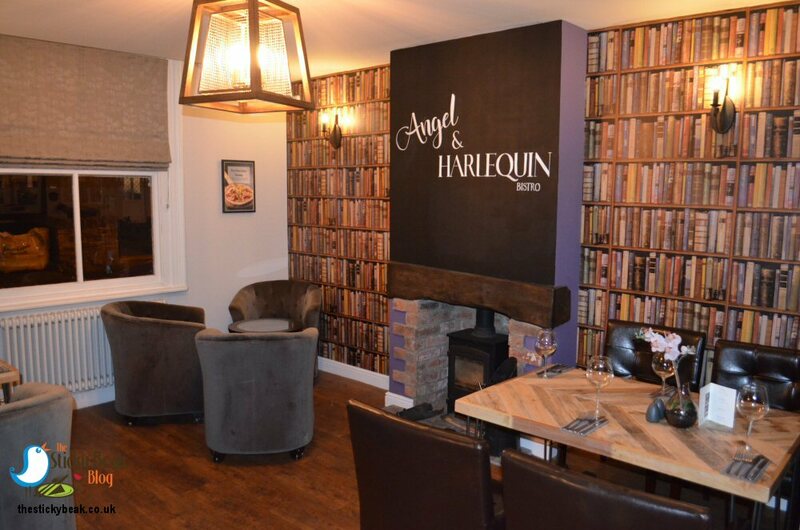 Fast forward to the present day, and after two extensive refurbishments to the exterior and interior, Chris was ready to re-launch a new look for the venue; behold, Angel and Harlequin Bistro was born! With a mission to deliver top end dining in a traditional space, Chris unveiled the menu on 25th January 2019. As we stepped inside the calm relaxed vibe of the building seemed to wash over us, and we were greeted warmly by a gentleman who turned out to be Chris’ father-in-law. After sorting drinks out (Malbec for me, Peroni for The Man) we went on a bit of a guided tour around; this place is full of nooks-and-crannies, giving it a lovely cosy, intimate feel. Upstairs there is a separate room that is perfect for larger dining groups or for parties and special occasions, and there are several sets of those amazing “spider” lights that I wish I could have in the Nest! Like many village hubs, Angel and Harlequin Bistro is dog friendly. 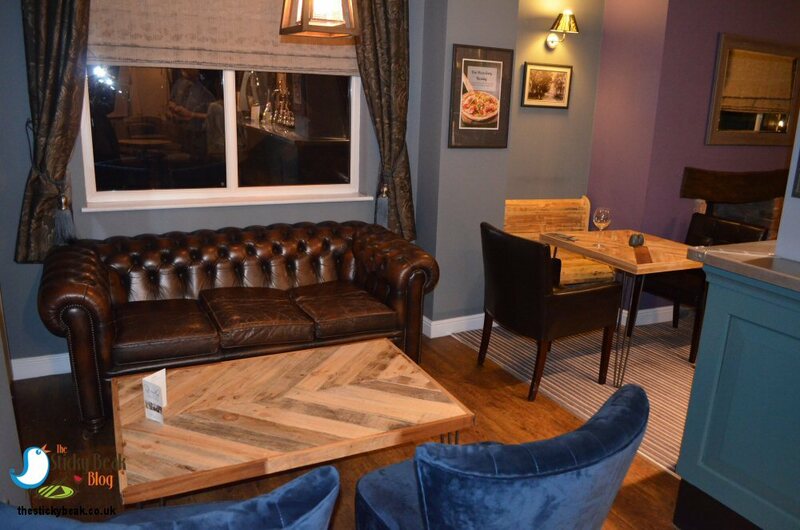 Actually it’s more dog friendly than your average dog friendly venue; dogs are allowed anywhere where there’s wood flooring and Chris even offers pre-bookable dog tables for diners – that really is going the extra mile, I reckon. I think the best bit though is the fact that the in-house pastry chef makes a selection of cakes and other sweet yummy treats each and every day! If this was local to me, I would be popping in every day for a freshly roasted coffee and a piece of cake; well walking the pooch uses up calories, so energy levels need to be topped up!. 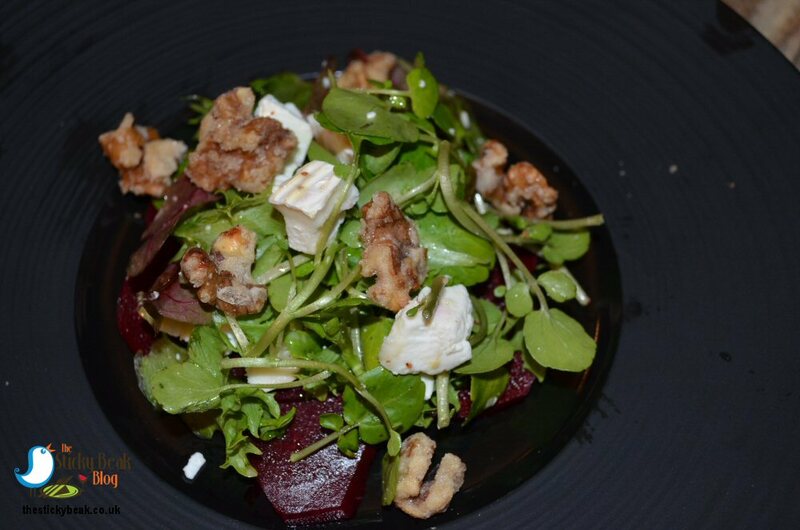 Anyhow, back to our meal; I opted to have the Beetroot and Goats’ Cheese salad with Watercress and Candied Walnuts for my starter, and The Man went for the Smoked Haddock and Cheddar Fishcake with Capers and Samphire. 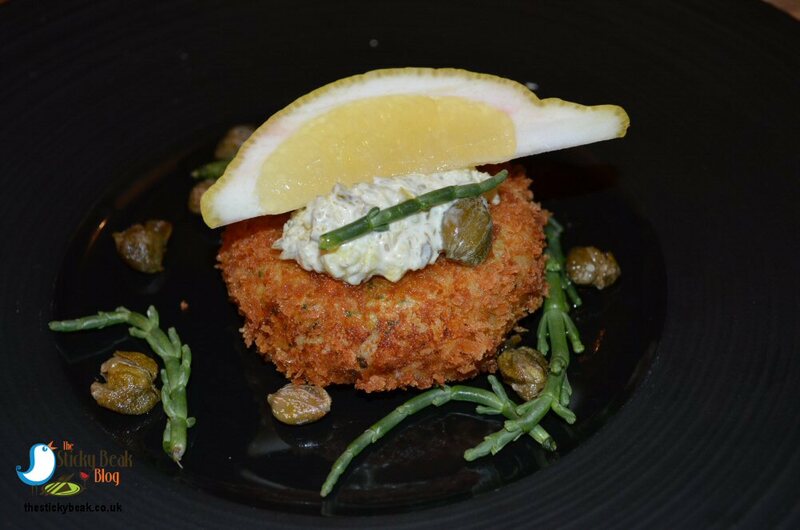 His Nibs’ Fishcake was a lovely thick affair with a nice, light crisp crumb coating on it. Inside, the fish, potato and cheese mixture was lovely and smooth so that it had a real comfort-food factor to it. Taste wise, it was subtler than you would initially think; smoked Haddock to me, has always been quite strong and akin to kipper and mackerel. Chris has managed to tone it down in this morsel, which I think will give it wider appeal. The Man Bird was really tucking in to it, saying how good it was; he even liked the Samphire! The Capers were a step too far for him, but I absolutely love these little chaps, so I scoffed them. My salad looked beautiful on the plate and it had a little surprise in store for me. Normally, we think that Beetroot will be soft to some degree in texture, but Chris’s interpretation left its crunch and firmness intact. This lovely vegetable had a light pickle edge to it which paired beautifully with the salty tang of the Goats’ cheese chunks. Peppery Watercress added its character to the dish, and the savoury components were tempered nicely by the sweeter Candied Walnuts whose crunch gave some extra texture too. Our lovely server had come to check that we were happy with our food and see if we needed drinks refreshing. A steady stream of people came through the doors; some to eat in with friends, others local to the village that had ordered Pizza to take out and were having a cheeky tipple whilst they waited. 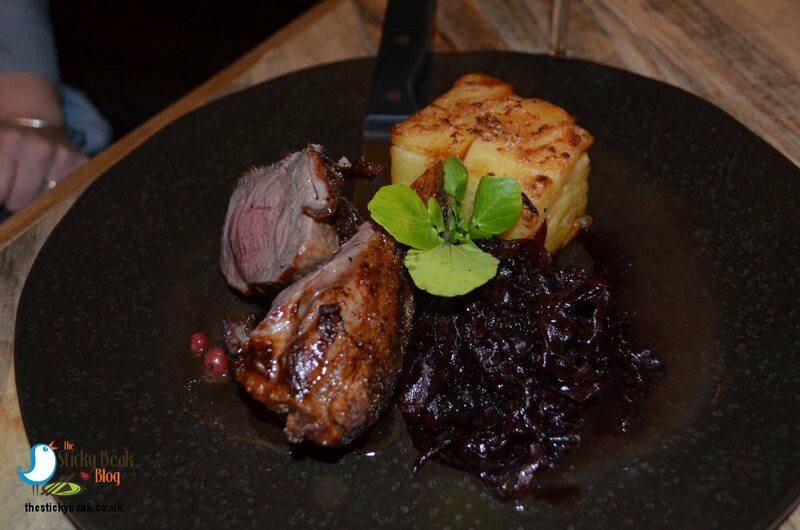 For mains we’d chosen Rump of Lamb with Dauphinoise Potatoes, Braised Red Cabbage and Redcurrant Gravy (yours truly) and Hickory Chicken Breast with Crispy Bacon, Hand cut Chips, Homemade ‘Slaw, and BBQ Sauce (The Man). Now, I don’t know about you dear reader, but I always find it hard to gauge whether a side order is needed when dining somewhere new. 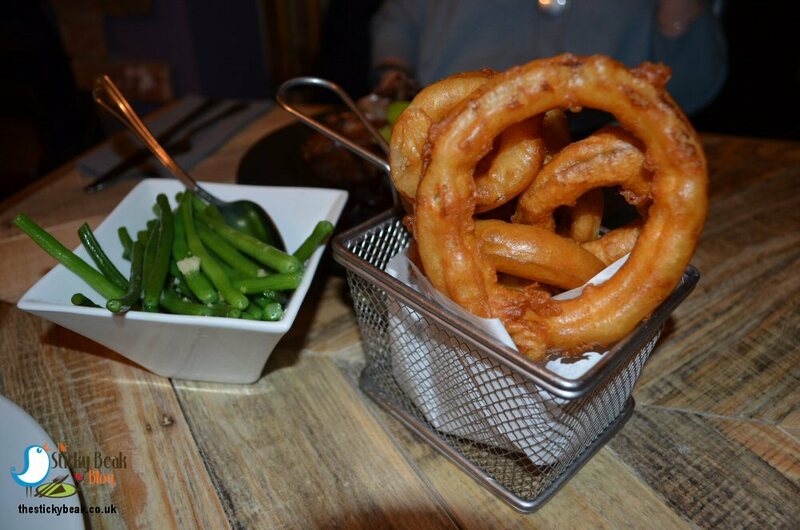 As per usual, we erred on the side of caution and ordered Garlic Green Beans and Onion Rings as well. As I said in my opening paragraph, nothing much shocks me anymore but the huge portion of Lamb that was set before had my mouth gaping open like a champion fly-catcher! Seriously, there were two pieces of pink rump, each a good 2” thick and probably 4-5” long; now I know I have a hearty appetite, but I was going to have my work cut out here!! 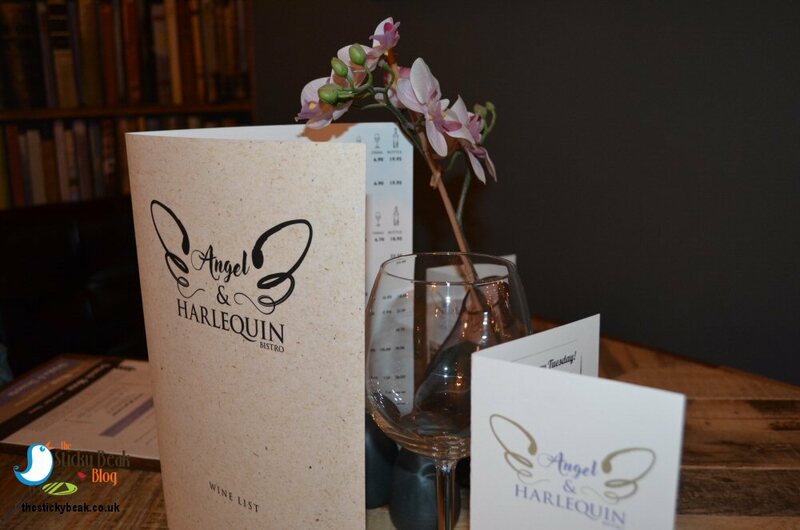 What I like about Angel and Harlequin Bistro is that you have the choice of your Lamb being served Pink or well done – everyone likes to have choices, don’t they? The Lamb meat was just stunning, both in terms of texture and taste; its taste burst onto my tongue as if it was still gambolling about in the field and it was superbly dense, but juicy when bitten into. The warmth of Star Anise used to braise the Red Cabbage could be discerned on the palate as well, and the sultanas had hints of festive spices to them which intensified the comfort factor of this vegetable accompaniment. A precise square of Dauphinoise Potato had been carefully browned on its top and placed gently on the plate, and this imparted a gentle breath of Garlic and Cream into the mix. More Garlic came via the Green Beans I’d ordered, and these were lovely and firm to the bite with a subtle glossiness from melted butter on them. I could smell the Hickory smokiness of His Nibs’ Chicken across the table, and the grin on his mush told me that it was just as good taste-wise! 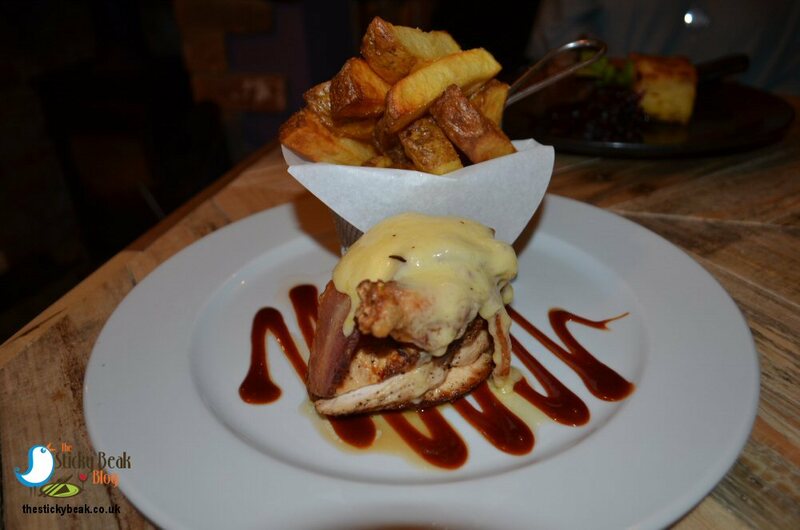 The Chicken breast had been cooked with its skin on, which made it incredibly moist and juicy to eat. Even better, it had a thick blanket of generous Bacon slices and melted cheese over it (needed on such a cold night) and crowning it all was a deep layer of rich, piquant BBQ sauce. Brilliantly thick chips got dunked in the sauce too, although they were delicious when eaten solo; we thought they tasted as if they’d been cooked in fat for a richer taste. The Onion Rings were massive as well (there’s a definite theme here, isn’t there?) with a fabby crisper-than-crisp batter to them. Thick slices of Onion were still just-firm to the bite and had a superb sweetness to them; these are real crowd pleasers, that’s for sure. Our server had been to check that all was well with our meals, and was happy (and probably a bit surprised) to take a pair of clean plates back to the kitchen. Even given our 5+ years reviewing food, we still never learn to stop when our tummies are practically fit to burst! In our defence though, the puddings at Angel and Harlequin Bistro in Spinkhill were just too good to pass up. 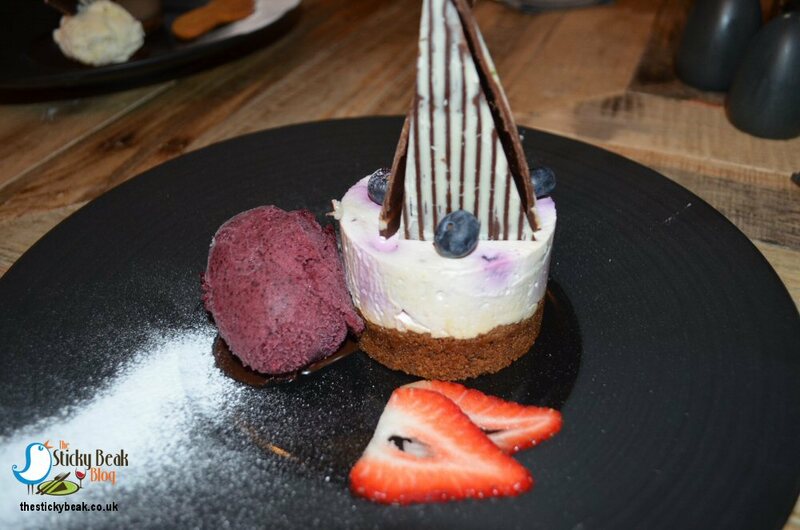 Surprisingly, His Nibs didn’t plump for the Sticky Toffee Pudding with Rum ‘n’ Raisin Ice Cream – and I would’ve staked my last quid on it; instead he chose the Blueberry and White Chocolate Cheesecake with Blueberry Sorbet. 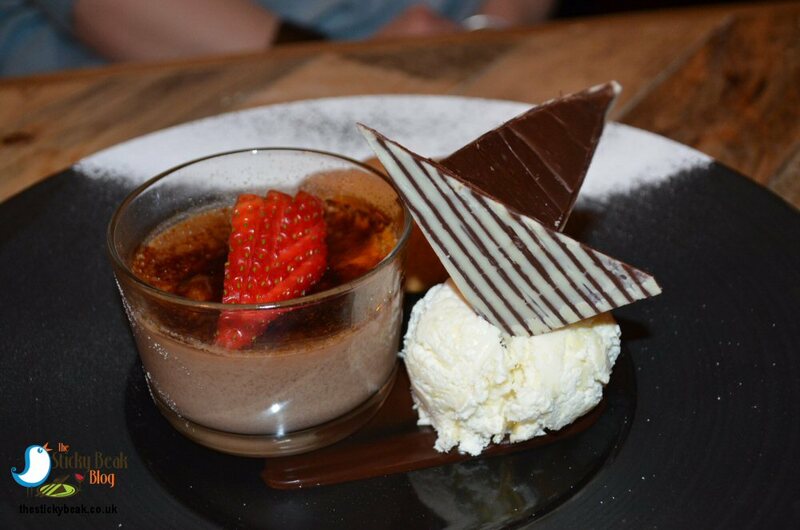 I’d spied the Dark Chocolate Crème Brulee with White Chocolate Ice cream and Gingerbread Angel, and fancied that to round off my meal. The Boy Wonder was more than happy with his choice; the deep ginger base was topped with an impossibly deep White Chocolate layer that had whole Blueberries nestled within it. This morsel wasn’t overly sweet as some cheesecakes can be; instead you got the wonderful sour edge of the Cream Cheese coming through on the palate. Paired with the sharp, bright tasting Sorbet, this was an absolute corker of a dessert by anyone’s standards. One of the sweetest sounds to my ears is the crack of a properly done, decently thick caramelised sugar top in a Crème Brulee; the one that was set before me had a marvellously thwackable quality to it. Honestly, no matter how many times I have Crème Brulee, each time my spoon breaches the hard sugar layer it always makes me grin. Everywhere I’ve been does their Crèmes slightly differently and it was no different at Angel and Harlequin Bistro; here it is more lightly set than some places, but bizarrely it fades from set at the top and gradually softens as you get down it. It had a superb flavour and was very indulgent, and this extravagance was ramped up even more by the White Chocolate Ice Cream. Actual slivers of White Choc are suspended in the cream concoction, and as they melt on your tongue you get the full glory of their taste and creaminess! The just-soft Gingerbread Angel was delicious; not chewy, not hard just the perfect in between texture, and the warming Ginger edge was just the job on the chilly winter night. I’m proud to say that the child within me is still alive and kicking, so I couldn’t resist popping the Gingerbread Angel into the Icing Sugar dusting and letting it make its own snow angel! A couple of coffees concluded the evening, and what an astounding night it’d been. The food was some of the best we’ve had for a while, and very generous size-wise; Chef Chris Norfolk is clearly a feeder. Angel and Harlequin Bistro is definitely going to blow this venue’s former reputation as “just a pub” clean out of the water!! Hot Wings unreservedly awarded here to this incredible team.